Jeans Size Charts for Wrangler, Diesel, Levi’s + Many More! At least one pair of Levi’s jeans can be found in every wardrobe because they always fit. No matter what you want to do, they are very versatile and can be combined with any style. The same is true for Diesel jeans or Wrangler jeans. Unfortunately, the jeans sizes vary significantly between the different manufacturers and also between different styles from the same brand. Brands follow their own guidelines and there are no clear standards available. The tables below shall help you to find the perfect size of your jeans from your most beloved brands such as Levi’s, Diesel or Wrangler. Waistband: The waistband is always measured at the narrowest point of the body, namely the waist. However, if you are looking for a pair of low-rise pants, such as hipsters, the widest part of the body must be measured: at the top of your buttocks. 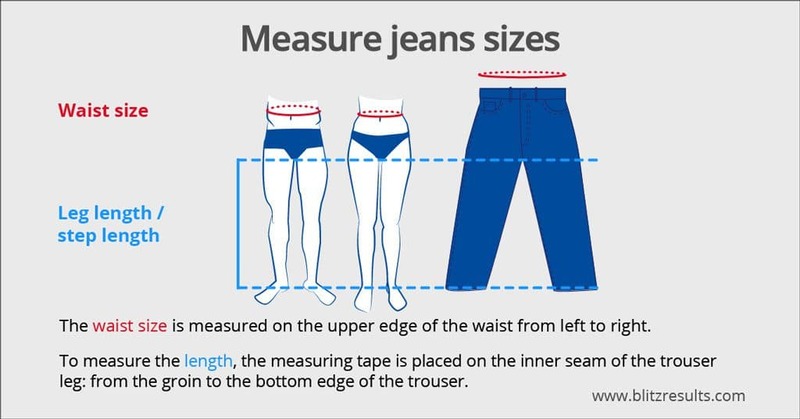 Length: If you are looking for the length of the jeans, you have to measure the inside of the leg. If you wear pants longer or regularly wear very high-heeled shoes, then measure all the way down to the bottom of the heel. If the jeans are to stop at the level of the shoes or the ankle, this length is reduced. Levi Strauss & Co. is known worldwide for its denim jeans. Founded in 1853 in San Francisco by the Franconian immigrant Levi Strauss, the first modern jeans trousers were created at the beginning of the 20th century. To this day, the company is still family-owned and is the global market leader in the sale of jeans and other pants, but is now facing significant competition from jeans brands such as Lee. The Levi Strauss Group employs just under 11,000 people, whose product range now includes not only jeans but also other clothing and accessories. In addition to the Dockers and Levi Strauss Signature brands, Levi’s is probably the company’s best-known brand. It achieved fame especially in the 1960s with the publication of the Levi’s 501 jeans model, which is still today the most worn jeans in the world. There are many Levi’s jeans on the market today – from boyfriend jeans to skinny jeans. Shirts and Levi’s blouses, as well as attractive summer dresses, are also available to the ladies. Men can enjoy not only the wide range of jeans but also men’s shirts. The assortment of the San Francisco-based company is complemented by Levi’s bags of all kinds – from handbags and shoulder bags to briefcases and backpacks, there are many designs to choose from. The Diesel brand stands for high-quality products in the apparel, footwear, accessories and perfume sectors. The Italian fashion label was founded by Renzo Rosso in 1978 and is still managed by the company’s founder. Approximately 1,300 employees in more than 200 company-owned branches generate annual sales of more than one billion US dollars. The company is headquartered in Molvena, Italy with offices in twelve other countries. Diesel became particularly famous in the 1990s for its “Saddle” jeans model, which is today considered a diesel classic. To this day, the cut of these jeans is also used by other well-known manufacturers such as G-Star and Scotch & Soda in the production of jeans models. At the end of the 1990s, diesel jackets were particularly popular and achieved cult status. So don’t miss out on these fashionable items of clothing and enrich your chest of drawers with a fashion item from this well-known brand. Today, the Diesel brand offers a wide range of women’s apparel, men’s and women’s shoes and bags. Diesel women’s pumps convince by their versatility and their fashionable designs. Elegant high-heeled heels for special occasions as well as comfortable sports shoes for the leisure time can be found here. There is also a wide range of men’s sneakers – from flip-flops to classic leather shoes. The same applies to diesel womenswear, where not only jeans but also dresses, bermudas, skirts and much more are available. Wrangler stands for American cowboys riding rodeo, spitting chewing tobacco and galloping to the west without a saddle. This is how the founder of the American denim manufacturer Wrangler, C. C. Hudson, wanted to see his brand. However, it was not yet foreseeable in 1904 that Wrangler would actually become a modern jeans and lifestyle brand of the first order. Today, it is part of the network of the American fashion giant VF Corporation, which owns brands such as Eastpak, Lee, Vans and The North Face. Nevertheless, they stuck to their original Western style. The brand has grown so large that different collections are now available for different markets. The assortment of the European or German line would certainly not sell particularly well in America. But that doesn’t mean Wrangler hasn’t kept his own style. In addition to the Wrangler logo on the back pocket, the perfect fit of the Wrangler Men’s Jeans, in particular, ensures that they are recognizable and appreciated by the generation of satisfied jeans lovers. However, Wrangler’s selection is not limited to jeans. Both men and women will find what they are looking for in the seasonally changing collections. Men’s check shirts, ladies t-shirts, denim shirts, jeans jackets, ladies’ jeans, children’s jeans and even more jeans. The brand can’t escape its cowboy image that much. But it also doesn’t need it at all, because cowboys are pretty cool, which is proven not only by the just so trendy men’s western booties. To determine your jeans size, you need to measure your (1) waistband and (2) leg or step length. The waistband is always measured at the narrowest point of the body, namely the waist. For low-rise pants, however, you need to measure the area at the top of your buttocks. For the jeans length, measure the inside of the leg, from the crotch all the way down at the level of the ankle. Jeans sizes vary significantly across the different manufacturers (e.g., Levi’s, Diesel, or Wrangler) and also between different styles from the same brand. And so, the best way to find the right-fitting jeans size for you is to refer to the published size charts of such brands.